Record-setting temperatures around 30 degrees higher than usual were recorded throughout the tri-state area this weekend. A new record was set Sunday in Central Park as the temperature hit 71 degrees, smashing the old record of 63 degrees set in 1998. Temperatures at local airports set records as well, with a high of 69 recorded at LaGuardia and 64 at JFK. A record of 65 degrees in Newark was also broken, with temperatures hitting 70 degrees. The first official day of winter was Saturday, but it coincided with a warmup to the low-to-mid 60s. Newark's high of 64 degrees broke the old record of 62 set in 2011, and the high of 62 in Central Park tied the old record set in 1923 and 2011. Record-high temperatures were recorded in cities throughout the Northeast Saturday and Sunday, including Philadelphia, where it hit 67 degrees both days, and Atlantic City, where it reached 67 degrees Saturday and 68 degrees Sunday. The average high in New York City for Dec. 21 and 22 is 41 degrees. 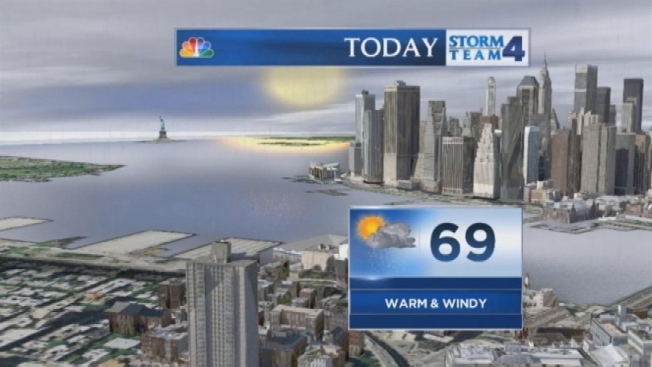 Expect some rain throughout the day Sunday, with the possibility of a thunderstorm. Temperatures slip into the 50s on Monday, and then the cold returns on Christmas Eve and Christmas, with highs back in the 30s. No snow is forecast for the holiday.